We invite you to have a conversation with a family member, friend, or colleague. A trained team of StoryCorps facilitators will be on site for the weekend and can formally record 18 stories over the three day period. Teams of locally trained volunteers will allow for additional recordings! 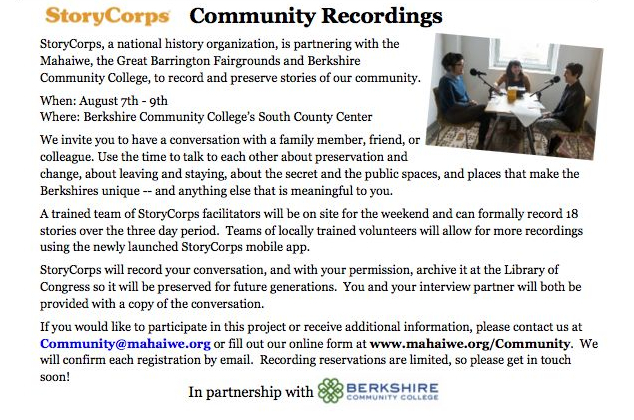 The recordings will take place Friday, August 7th through Sunday, August 9th from 9am – 4pm at Berkshire Community College South County Center located at 343 Main Street in Great Barrington. You will have 40 minutes of uninterrupted time to talk to each other about preservation and change, about leaving and staying, about the secret and the public spaces and places that make the Berkshires unique — and anything else that is meaningful to you. StoryCorps will record your conversation, and with your permission, archive it at the Library of Congress so it will be preserved for future generations. You and your interview partner will both be provided with a copy of the conversation. Recording reservations are limited and we will confirm each registration by email.